It’s time to start thinking about Valentine’s Day again and if you are like us, we are sure that you are wondering what you are going to get your special someone this year. If you’ve been with your partner for many years, it can be hard to think up yet another interesting gift for yet another Valentines’ Day. We completely understand and today we want to help. Though our suggestions aren’t as traditional as a heart-shaped box of chocolates or a sparkly diamond necklace, they are definitely unique and—in our opinion—just as romantic. Electronic locking systems aren’t just for businesses or commercial buildings anymore. Many homeowners in Spring are opting for electronic locking systems because they are not only convenient, but they also can increase your security. A traditional deadbolt that is installed correctly is still a great means for keeping who you want out of your home, out, but an electronic system can add an element of security that only modern homeowners get to enjoy. Not only does an electronic system not require keys—keys that can get lost or copied—but some electronic locking system technology allow you to lock your home using your phone, giving you peace of mind no matter if you are at work or a thousand miles away. Show how much you love your honey by installing a locking system that is as secure as it is convenient. Another wonderful modern advantage is transponder keys. They not only give back the joy of owning a car, but they can also help your loved one feel safe. Transponder keys come in various shapes and sizes with varying abilities. However, most allow you to lock or unlock your car while walking away from your car, while inside your home, or when you’re walking from the store with your arms full of grocery bags. Most believe that upgrading to a transponder key is way out of their price range, because the price that is quoted to them by the dealership is exorbitant. Our locksmiths in Spring can install the same quality of systems for a fraction of the cost. Has your special someone lost their transponder key? We can fix or replace those too! We believe that some of the greatest gifts aren’t those that traditionally come in big red shiny boxes, but those that can truly provide convenience and security. We get it. These might not be as romantic as a bouquet of flowers, but the way in which this gift is received may be all in the presentation. Present them with their new transponder key or the old locking system from your front door in a pretty wrapped box and maybe still consider getting them some chocolates too. Call Our Locksmiths in Spring! 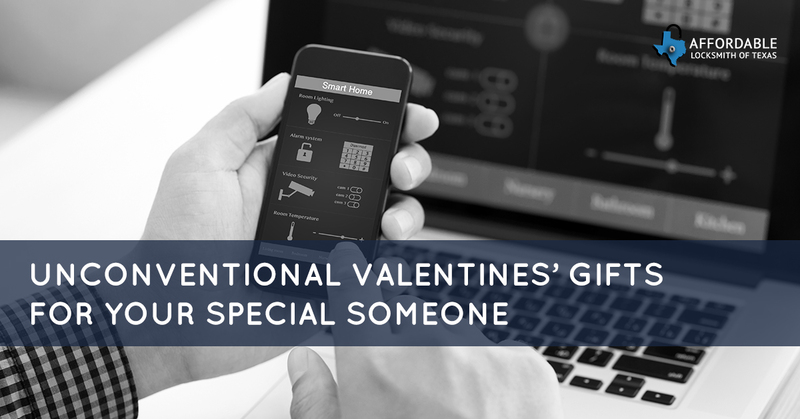 Whether you decide to surprise your significant other with one of these gift ideas or you want to love on yourself this Valentine’s Day, the locksmiths of Affordable Locksmith of Texas would love to help you have the security that you need and the upgrades you deserve. Contact us for locksmith service in the Spring area!